Hot summer days taking their toll on you? 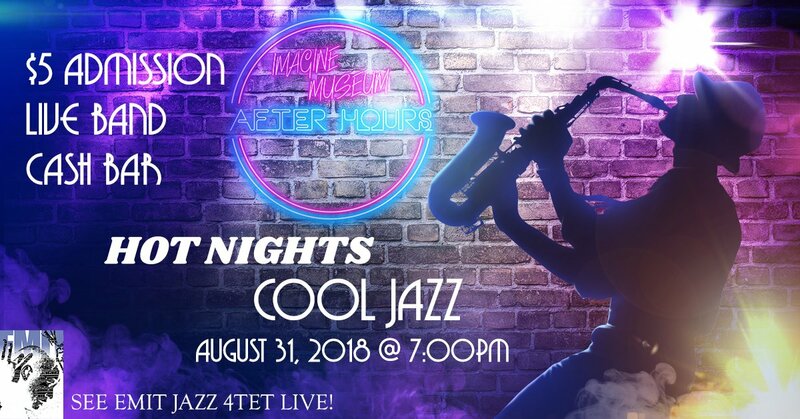 Then come Take Five and swing on by Imagine Museum’s After Hour’s event on August 31st for some cool jazz to help soothe your soul (and sunburns!). EMIT Jazz 4tet will be serenading your senses from 7-9:30 and setting the mood for you as you stroll through our stunning collection of American Studio glass. Tickets are $5 and include entrance into the museum and access to our permanent collection, as well as live jazz and a cash bar to help boogie your way into the weekend. Tickets are available online at https://bit.ly/2ASV5fU or can be purchased the night of at our guest service counter. We look forward to seeing you for a night of jazz, glass, and a little sass!